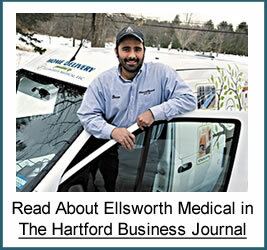 In its third generation of ownership and management, Ellsworth Medical has become the source for medical supplies in the Northern Hartford County area. We service customers in Windsor, Hartford, West Hartford, East Hartford, Manchester, South Windsor, East Windsor, Bloomfield, Windsor Locks, Enfield, Suffield, Granby and other surrounding towns. We're just a phone call away from helpful advice and are committed to finding you the right products for your needs. In 1981 Eleanor Sadoski established a small storefront on Windsor Avenue. In 1992 she retired and turned Ellsworth Medical over to her daughter Maggie. Since then, Maggie Cosker has continued to pursue the family business at its present location in the Windsor Shopping plaza. Our belief at Ellsworth Medical is simple: We want to take care of our customers as if they were part of our own family. That's why we say we're one generation caring for another. We want to find the right products to enrich their lives. We take pride in helping our customers achieve the highest quality of life. We invite you to become a part of our family tree at Ellsworth Medical. Give us a call, contact us, or stop by today.